Villa Malen is in a perfect central location! The beach, centre and marina of Cala D'or are all within 5 minutes' walk. A huge number of cafes, restaurants, shops and bars are all at your fingertips, and a choice of 6 more fantastic beaches are all within very easy reach by car, road train or bus. This 5 bedroom villa is spacious, with a bright and colourful interior, ideal for larger groups. WiFi and air conditioning/heating in the bedrooms are included. It has to be the central location - the beach, resort centre and beautiful marina are all within 5 minutes' walk! Villa Malen has a private swimming pool surrounded by ample space to sunbathe. The brick BBQ and covered dining area are also ideally situated right by the pool. The grounds are surrounded by hedging and traditional stone walls, with a built-in bench - the ideal place to sit with a cool drink or book during the day. Large wooden gates open onto the villa grounds, with 5 steps up to the entrance porch and front door. On the ground floor is the main lounge and kitchen. This lounge area has plenty of seating and a flat screen TV, as well as a smaller seating area around the corner. The adjacent kitchen has all mod cons as well as a door giving access to the terrace and external staircase to the first floor. Here you'll find the second lounge with a small TV and terrace, a dining area and kitchen. On the ground floor is a double bedroom with en suite shower room, a twin bedroom and separate shower room. These bedrooms both have patio doors onto the side terrace. Upstairs is a twin bedroom with en suite shower room, and a twin bedroom and double bedroom sharing a shower room. Both of these bedrooms also have their own small terrace area to either side of the house. The position of Villa Malen could not be better! The beach, centre and marina of Cala D'or are all within a few minutes' walk. The stylish marina and centre of the resort both have a huge number of restaurants and cafes to explore. The area also has a total of 7 beaches, the nearest being Cala D'or Beach itself, with the others all within a 2 mile radius. The marina is undoubtedly the heart of Cala D'or, only 5 minutes' walk from Villa Malen. A huge choice of contemporary restaurants line the waterfront, where you can day overlooking the boats. Seafood and paella are understandably the specialities of the area. If you fancy seeing more of what the resort has to offer, you can catch the road train from here which will take you into the neighbouring areas of Cala Egos and Cala Ferrera, as well as the centre of the resort itself. The main Cala D'Or Beach is just one of 7 beautiful coves in the local area, making Villa Malen a great choice for beach lovers. Each of the beaches is small, but has its own character, with beautiful golden sand and clear water. A little further afield, accessible by car, road train or bus, is the beach of Cala Mondragó. Set in the natural park of Mondragó, with a stunning picnic area and walkway through the pine forest, this superb beach is well worth seeing. There are a few different waterparks on the island, the nearest being Aqualand in El Arenal, around 45 minutes' drive back towards Palma. Keen golfers should head for Golf Vall D'or, 6 miles north of Cala D'or. Villa Malen is not available to book for season as it is sold out. Take a look here at the Majorca villas that are currently on sale. Fab villa, great location and amenities. Fantastic location. Good size and having two separate kitchens really helps with a large family. Villa Malen was just perfect. We wanted a villa close to the beach and town - and it delivered. 2-minutes one way to a lovely beach, and 2-minutes the other way to shops, bars, and restaurants. The villa is large and spacious - with lots of room for everyone. The pool is a good size, and the garden is private and quiet. 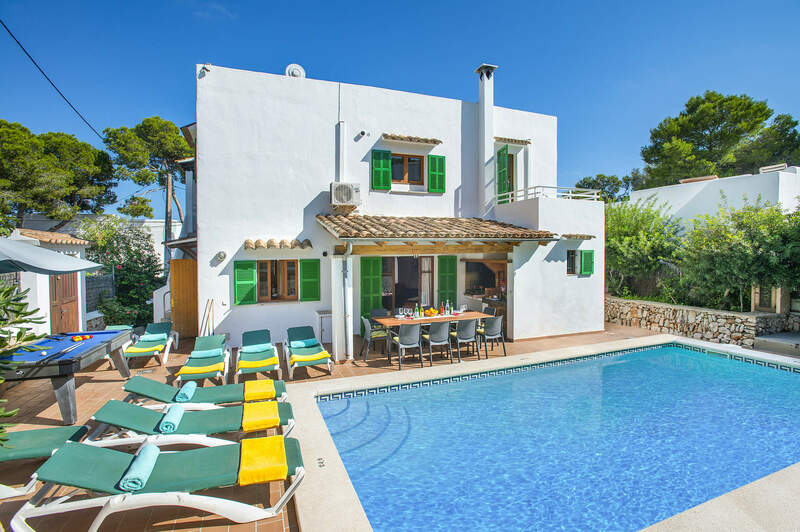 An excellent choice for families wanting to get away from it all - and to be close to everything lovely Cala D'or has to offer. Web page description of villa was accurate. Great location - in a quiet spot and handy for beach, shops/restaurants and marina. The villa was amazing, we had a great family holiday. The villa was clean, spacious and very well equipped. We would definitely use it again and would highly recommend Villa Plus to family and friends. An excellent experience all round. So much so that we are going to book the same villa for next year! Great location, superb facilities, would recommend this villa! The villa was fantastic and suited us perfectly. You could not ask for a better location. Walking distance to shops, bars, restaurants, supermarkets and the beach...what more could you want.